Brown: Interest rates due to rise? Are we on tap for an increase in interest rates? According to Garrick Brown, director of research at real estate firm Cassidy Turley, the harsh winter most of the country has been experiencing is responsible for weak employment figures earlier in the month, and in addition to the drag from that and the recent stock-market fluctuations, the inevitable rise in rates may well be delayed. There is already talk, Brown notes, that the Federal Reserve may slow the tapering of the stimulus – which makes him think that a June or July timeline for rate increases is more likely. So does this mean the economy is on the edge? Brown says no. “The weather has been incredibly lousy,” he writes. “That is it.” For now, he adds, we are continuing at the same slow pace of recovery, which is frustrating to us but may actually benefit the investment marketplace. When Wyoming architect John Carney and his wife Elaine bought a five-acre lot at the top of the market, they had their hearts set on a huge family compound. But then the market went belly up and their plans had to change. Located in the town of Wilson, the two-bedroom, two-bath guesthouse has a central living, kitchen and dining space, flanked on either side by bedroom and bathroom suites. There is a courtyard effect thanks to the garage, which was built at the same time. Features include window walls, extensive cabinetry and a smaller-than-normal refrigerator in the 12-foot kitchen. Check out the Houzz article for more details. 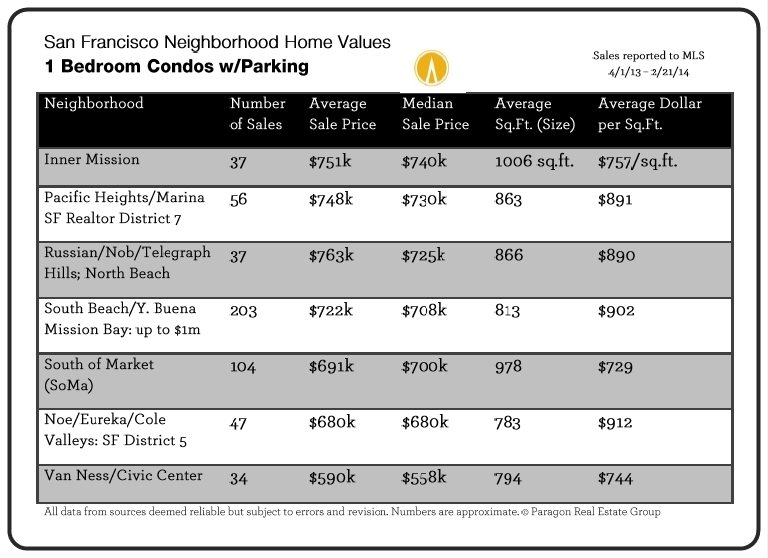 These tables report average and median sales prices and average dollar per square foot values, along with average home size and units sold, by property type and bedroom count for a wide variety of San Francisco neighborhoods. The tables follow the map in the following order: houses by bedroom count, condos by bedroom count, 2-bedroom TICs, and finally a small table on 2-unit building sales. The analysis is based upon sales reported to MLS between April 1, 2013, when the last big surge in home values began in San Francisco, and February 21, 2014. Value statistics are generalities that are affected by a number of market factors and all numbers should be considered approximate. “m” signifies millions of dollars; “k” signifies thousands; N/A means there wasn’t enough data for reliable results. Expanding your screen view to zoom 125% will make the map and charts that much easier to read. The average size of homes vary widely by neighborhood. Besides affluence, the era and style of construction often play a large role in these size disparities. Some neighborhoods are well known for having “bonus” bedrooms and baths built without permit (often behind the garage). Such additions can add value, but being unpermitted are not reflected in square footage and $/sq.ft. figures. If a price is followed by a “k” it references thousands of dollars; if followed by an “m”, it signifies millions of dollars. Sales unreported to MLS are not included in this analysis, and where abnormal “outliers” were identified that significantly distorted the statistics, these were deleted as well. N/A signifies that there wasn’t enough reliable data to generate the statistic. The Median Sales Price is that price at which half the properties sold for more and half for less. It may be affected by “unusual” events or by changes in inventory and buying trends, as well as by changes in value. 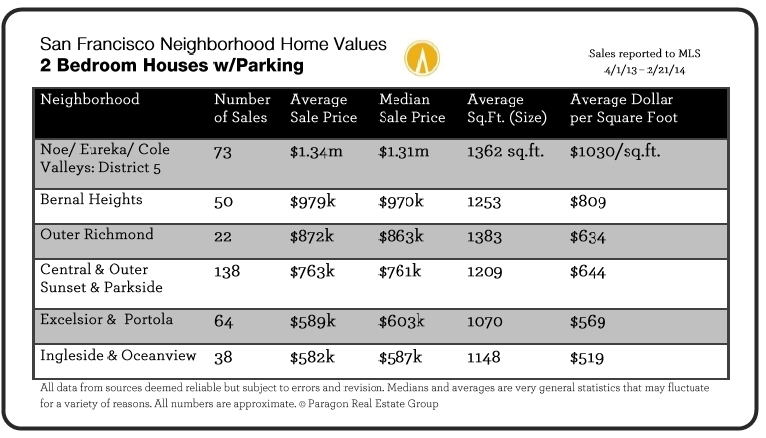 The median sale price for an area will often conceal a wide variety of sales prices in the underlying individual sales. Average sales prices may be distorted by one or two sales significantly higher or lower than the normal range. All numbers should be considered approximate. Dollar per Square Foot is based upon the home’s interior living space and does not include garages, storage, unfinished attics and basements; rooms and apartments built without permit; decks, patios or yards. These figures are typically derived from appraisals or tax records, but can be unreliable, measured in different ways, or unreported altogether: thus consider square footage and $/sq.ft. figures to be very general approximations. Size and $/sq.ft. 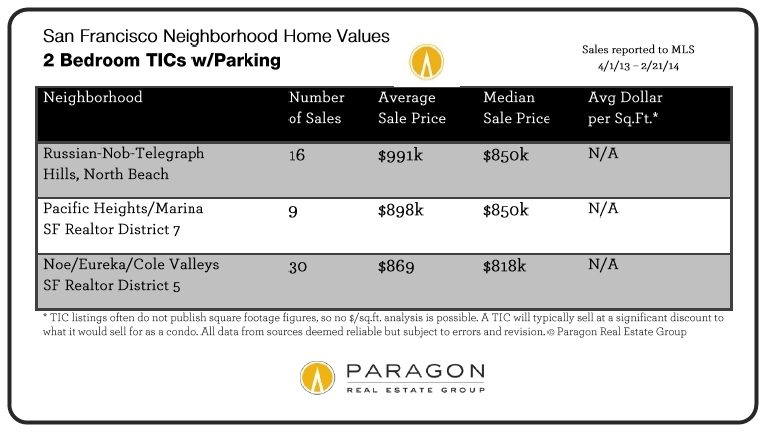 values were only calculated on listings that provided square footage figures. All things being equal, a house will have a higher dollar per square foot than a condo (because of land value), a condo’s will be higher than a TIC (quality of title), and a TIC’s higher than a multi-unit building’s (quality of use). All things being equal, a smaller home will have a higher $/sq.ft. than a larger one. Yesterday we talked about shifts in the market and speculated on how these might be affecting other elements, namely price. Now let’s break down some neighborhoods and look at what’s going on there. 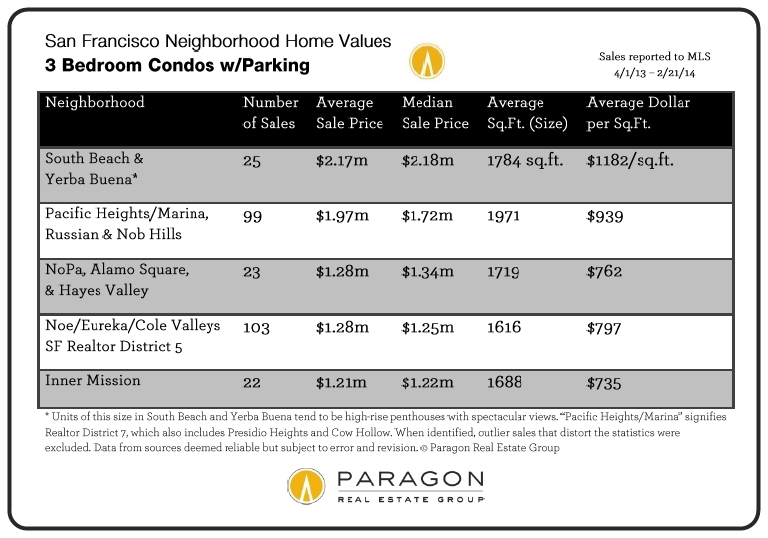 Paragon has found that in San Francisco, some of the most affluent neighborhoods – including the Pacific Heights-Marina district and the Noe, Eureka and Cole Valleys district – began their recoveries in the second half of 2011. That was well before just about any other place in the city or country. Prices began to soar for these areas in the beginning of 2012, while other areas played catch-up. But in 2013, the dynamic flipped, seeing appreciation rates in comparatively less expensive neighborhoods surging, while the more affluent areas saw a slowdown. 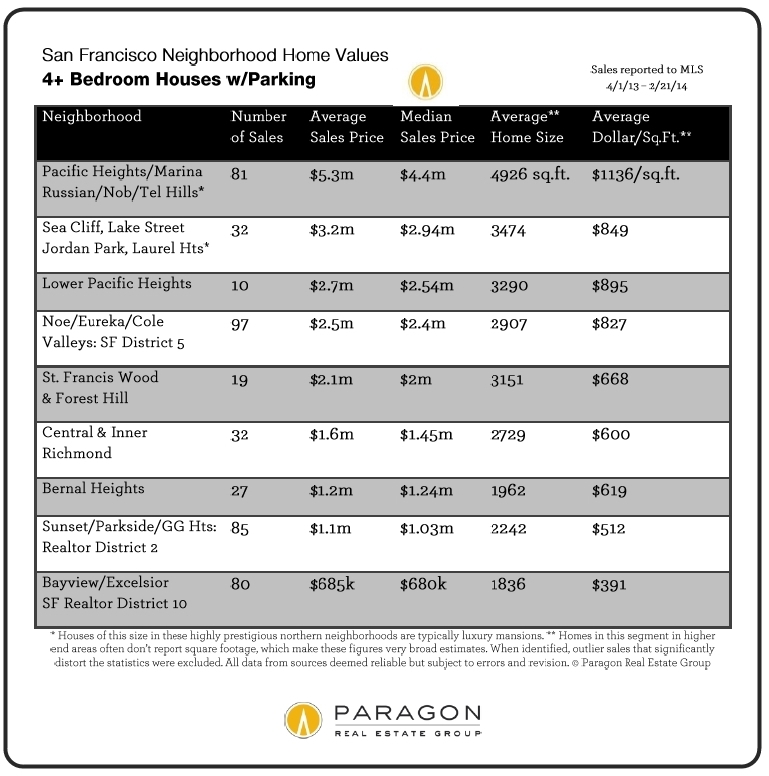 One of the neighborhoods that saw a major surge in 2013 was Bernal Heights. Check out the accompanying chart for more on this. And in a trend that no doubt affects SOMA, we’re seeing an unusual spike in the condo median sales price. In January, the median price for San Francisco houses dropped an insignificant amount, from $938,000 in the fourth quarter of 2013 to $928,000 in January of this year. 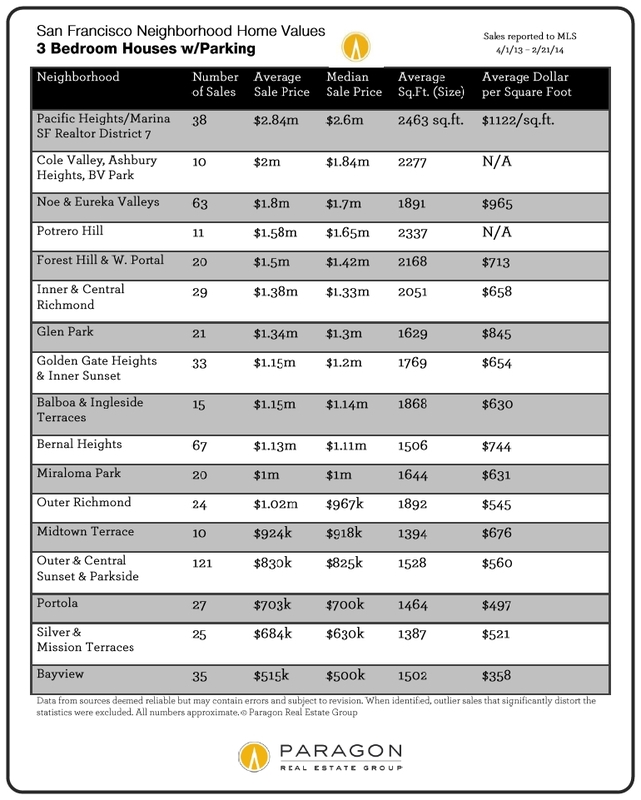 However, San Francisco condos saw a large leap from $835,000 in the fourth to $927,500 in January. That’s the highest monthly condo median price ever. Want more facts and figures? Get in touch. It appears that there may be changes on the horizon when it comes to the San Francisco market. In fact, those changes are already starting to take place. The word on the street is that the number of offers that are coming in on new listings is starting to drop – for example, a new listing that might have attracted 10 to 12 offers last spring is now seeing three or four. What’s more, according to Broker Metrics, for every two listings that accepted offers in December and January, another listing expired or was withdrawn without a sale. This, of course, brings us to the idea of home prices. While we’ve still got plenty of buyers looking at open houses and online listings, more of them seem to be first-time buyers, with the commensurate caution. With burnout afoot from last year’s bidding frenzies, the market – and that includes prices, of course – may be cooling. Now, is this just a lull before the spring sales season starts? According to speculation from the investment firm Reis, the city’s apartment-rent growth is projected to slow despite low vacancy rates and intense demand, because people simply cannot pay any more. Will this apply to other housing costs? Tune in tomorrow. Wondering what’s going on with new-home development in our fair city? Wonder no more. Thanks to Paragon’s handy database, you’ll be able to find out what you need to know in a matter of clicks. Whether the development’s status is in planning or sold out, you’ll be able to get the facts in a matter of minutes. Specifically, the site breaks down statuses into three main categories: in planning, approved, about to break ground, breaking ground; under construction, almost complete, pre-sales; and selling, almost sold out, and sold out. You’ll also find a large map here. We’ve covered all bases! Of course, numbers are just that: numbers. If you want the real skinny on the market, give me a call. I’ll let you know what’s up. Is your listing failing to attract attention? If so, it might be time to consider a price reduction. When is this step necessary? If the listing has been fully prepared, exposed and marketed for a reasonable period – usually a matter of weeks – and you haven’t received any acceptable offers, you may want to consider a reduction. It’s possible that market conditions have shifted, or perhaps your seller wanted to try the listing at a higher price than what was actually justified. In any event, you may have now concluded that the listing is overpriced. Plan on a direct meeting with your seller to review your marketing plan as well as response and feedback from buyers and brokers, as well as options for going forward to get the property sold. Remember, the decision is always up to the seller. Topics you may want to review include your marketing campaign to date, changes in market conditions and trends, changes in market inventory and timing issues. Take some time and make sure you’re on the right track. Where can I get 62K square feet? For a cool $13.9 million, you can get a 62,000-square-foot “Versailles-style” manse complete with an equestrian lounge, two guest houses, a 25-seat theater and landscaping that looks like a guitar. Yep, you read that right. Here’s the breakdown of the estate: It consists of a 54,400-square-foot main house as well as the equestrian lounge and guest homes, which brings it to the 62,000-square-foot figure. Built in 1997, the home also has an expansive entryway that gives way to square foot after square foot of eye-popping living space. 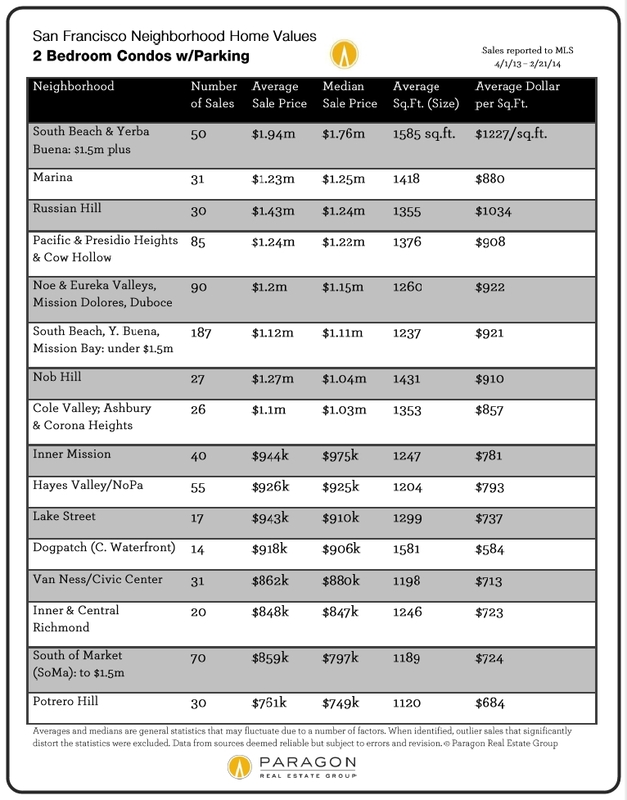 And for your reading pleasure, a list (as of late January) of the largest U.S. homes on the market. Enjoy! 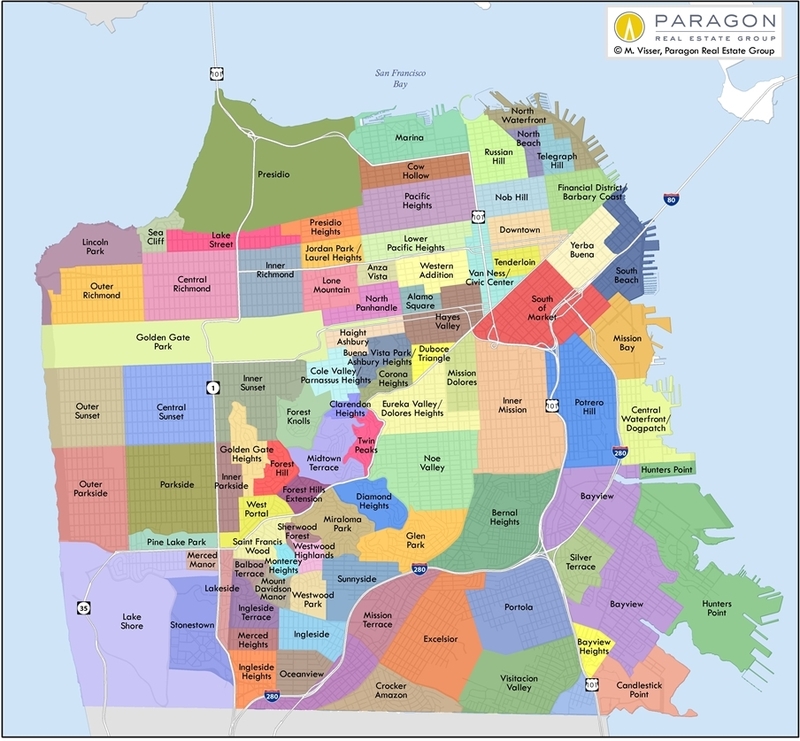 Quick: What’s San Francisco’s fastest-growing neighborhood? If you guessed Mission Bay, you win the gold. Just fifteen years ago, the place was home to empty Southern Pacific Railroad yards – and today, it is the scene of construction upon construction. We at Paragon see the future of Mission Bay at the intersection of Third Street and Mission Bay Boulevard. There you’ll see construction on two mid-rise apartment complexes: MB 360 and Venue, two of the newer additions to this bustling neighborhood. The development of Mission Bay dates back to 1998, when the city of San Francisco targeted it for redevelopment. The real estate firm Catellus was tasked with the responsibility of carving a new neighborhood out of the patchwork of utilitarian railroad yards. In 2003, Mission Bay saw its first large-scale project in the form of the 43-acre UCSF Mission Bay campus. Since that time, the likes of Fibrogen, Bayer and Nektar have located in Mission Bay, with residential development hard on their heels. 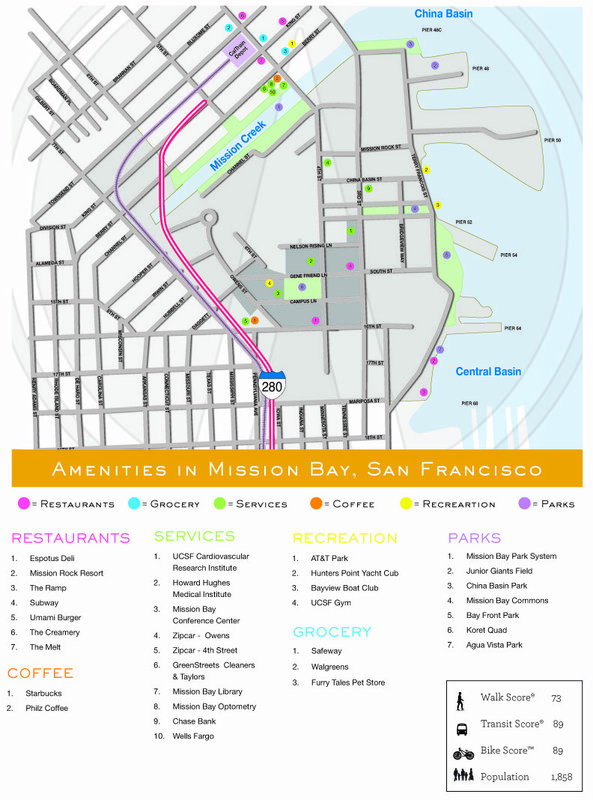 Today Mission Bay is a centrally located area with easy downtown access as well as convenience to Caltrain, Highway 280 and Muni. Many dining options abound, including Umami Burger, the Public House and Momo’s. Of course, we can’t forget the presence of AT&T Park. Batter up! It’s safe to say that Mission Bay is San Francisco’s fastest-growing neighborhood. Empty Southern Pacific Railroad yards only 15 years ago, the district is now home to some of San Francisco’s finest apartment and condominium complexes, with more going up seemingly every day. Want to see the future of Mission Bay? Stand at the corner of Third Street and Mission Bay Boulevard and look back toward downtown. You’ll see no fewer than four cranes busy at work, lifting girders and beams into place on what will soon be two new mid-rise apartment complexes, Venue and MB 360. Google Maps still shows the two-block stretch of Fourth Street between Channel and China Basin as an unbroken string of parking lots; they need to catch up. The neighborhood genesis is simple: once part of San Francisco Bay, Mission Bay was created over a period of time ending in 1910 when land excavated from other parts of the city – notably Rincon Hill – was dumped into the bay. The new real estate transformed a rough-and-tumble waterfront into a patchwork of utilitarian railroad yards and stayed that way for almost a century, until 1998, when Mission Bay was targeted for redevelopment by the City of San Francisco. Catellus, a real estate firm created when Southern Pacific merged with the Santa Fe Railroad, was charged with the job of creating the new neighborhood. In 2003, Mission Bay’s first major commercial development, the 43-acre USCF Mission Bay Campus, was completed. Since then, Mission Bay has become a magnet for healthcare, pharmaceutical and biotechnology business, attracting the likes of Bayer, Nektar and Fibrogen. Residential development followed UCSF to the neighborhood, beginning on a corridor of Berry Street, across Mission Creek from the heart of Mission Bay. It has since spread throughout the area. It’s not easy creating a neighborhood out of nothing but it is easy to see why Mission Bay was chosen for that task. Centrally located and within easy walking distance of downtown and AT & T Park, it offers easy access to Caltrain, MUNI and Highway 280, stellar new housing, great bay and city views and a long stretch of waterfront. Its developers have anticipated residents’ tastes and needs by attracting a diverse group of restaurants and night spots – nearby King Street is lined with new businesses, restaurants like Umami Burger, Nama, a branch of Amici’s Pizza and, at the ballpark, the Public House and Momo’s – including a neo-classic bowling alley/night club, Lucky Strike Bowl. King Street is also where residents can go for everyday services like Safeway and Walgreens, maybe stopping on their way home at the city’s newest library branch (opened in 2006), at 960 Fourth Street. Mission Bay has multiple parks, including the promenade behind AT & T Park and UCSF’s central Koret Quad, a large green space featuring multiple outdoor art installations. A section of the 500-mile San Francisco Bay Trail runs along the Mission Bay waterfront. Mission Creek, a venerable waterway at the western edge of the neighborhood, features green space and public walking paths on both shores. Mission Creek is also where you’ll find evidence of Mission Bay’s funkier days. A group of 20 or so houseboats – “floating homes” – has been bobbing up and down on the creek since the early 1970s, a small anachronistic outlier surrounded by progress and growth of a distinctly 21st-century fashion. Maybe Mission Creek’s funky houseboat settlement isn’t too much of an outlier, though. All along Terry Francois Boulevard, at Mission Bay’s eastern border, are reminders of a different time and place – weatherbeaten maritime buildings, no-nonsense working piers, ships in the Pier 54 dry dock and a bit of local color, the Bay View Boat Club. Home to an annual “Plastic Regatta,” the club’s modest yellow clubhouse was towed from Hunters Point to its present site at 489 Terry Francois Boulevard in 1962. There it stays, in the shadow of the shiny new headquarters of clothier Old Navy, a fun reminder that even in San Francisco’s most dynamically changing, newest neighborhood, a little bit of the old city shines through.